As one of the most prevalent rounds in law enforcement today, the .40 S&W has a history of stopping power and absolute reliability that cannot be ignored. 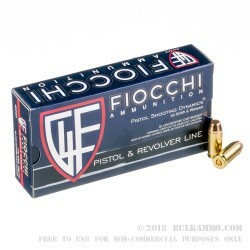 With the introduction of Fiocchi 170 grain .40 S&W Full Metal Jacket, that same level of intensity is now carried over to your training ammunition, is is guaranteed to take your level of proficiency to the next level. Loaded to the same exacting tolerances and chamber pressures as premium self defense ammunition, the Fiocchi 170 gr. 40 S&W Full Metal Jacket underscores the importance of learning to train just how you fight. 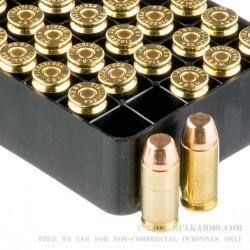 While cheaper surplus ammunition may come at a more economical price, the lightly loaded rounds will have a different point of aim, point of impact compared to high powered self defense ammunition, and can cause you to ingrain and learn poor shooting habits. 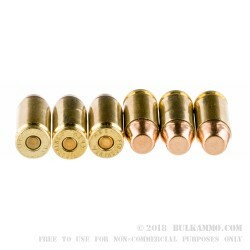 170gr flat nose round point copper plated rounds have an inherently flat trajectory, and feed smoothly into most semi automatic pistols due to the semi wadcutter profile of the bullets face. 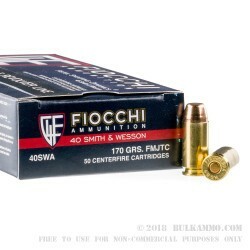 New brass cartridges make for excellent range reloads, and at a price point even high volume competitive shooters can afford to shoot, the Fiocchi 170gr .40 S&W Full Metal Jacket is is one of the best rounds on the market today for your training needs. So far so good and customer service was great.